It can take a long time for victims of child sexual abuse to disclose what happened to them, if at all. Research shows that one in three victims will never tell anyone. It also shows that sexual violence affects around 1 in 5 children in Europe and that about 80% of abusers are within the child’s circle of trust. The impact of sexual abuse can be devastating and last a lifetime. The good news is that sexual abuse can be prevented. To stop sexual abuse in sport, we must understand the factors that increase children’s vulnerability. Sexual violence thrives when there is tolerance for discrimination, physical violence and inappropriate sexual behavior. Imbalanced power relations, authoritarian leadership and rewards structures create relationships based on fear and dependence and hence vulnerability to the abuse of power. The loss of “natural barriers” because of the physical contact required and the sharing of showers, changing rooms and confined spaces with adults also expose children to several forms of sexual violence. And of course, there is the scandal avoidance by organisations and individuals who prefer to hide the abuse, thus sacrifying the victim and giving the abuser a licence to harm. Sport is great for children. It brings joy and develops healthy habits. It boosts self-esteem and creates a sense of belonging. Through sport, children abide by key values and learn important life skills. We must make sure that this is the case for ALL children. The Council of Europe Convention on the protection of children against sexual exploitation and sexual abuse contains the measures that must be taken to prevent abuse, protect the victims and put an end to the perpetrators’ impunity. These are obligations that currently bind 42 countries in Europe. The Start to Talk initiative just launched by EPAS, promotes the implementation of this Convention in the sport’s context. 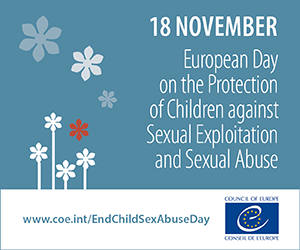 Since 2015, the date of 18 November is commemorated as the European Day on the Protection of Children against Sexual Exploitation and Sexual Abuse. The 2018 edition of this day will focus on the specific theme of "the protection of children against sexual abuse in sport”. All types of activities around this theme are welcome in order to encourage interactions, exchanges, in particular, between children and parents, educators, sports clubs, associations and federations, athletes and coaches, and other professionals. We invite you to join us in the fight against sexual exploitation and abuse in sport and we offer our support if you wish to get involved (please see the supporting packages below). Should you already have activities planned in relation to the topic in 2018, please share them with us. How did Start to Talk come about? “Start to Talk” is a Council of Europe call for action to public authorities, the sport movement and other stakeholders to take the necessary prevention and protection measures to stop child sexual abuse. By joining this call, governments, sports clubs, associations and federations, as well as athletes and coaches, pledge to take concrete measures to prevent and respond to abuse. “Start to Talk” is about adults breaking the silence and lending children a voice. Start to Talk was launched by the Council of Europe as a follow-up to the two successful Pro Safe Sport projects (in 2014 and 2017) co-funded by the European Union and the Council of Europe, and run by the Council of Europe Enlarged Partial Agreement on Sport (EPAS). to mobilise public authorities, the sport movement and the media triggering action and partnerships at international, national and local levels. What support does the Council of Europe and EPAS offer? disseminate knowledge and expertise by providing access to recent information and findings and to a network of experts. They are designed to be easily adapted to the national context. In addition to translating the texts into the national language/s, partners are encouraged to add country-relevant information such as legislation, existing policies and services, helplines and websites. They can also add their logos to the material. How can you join the initiative? To support these actions, EPAS offers a number of concrete services (see "Supporting packages" section below). Using the CoE logo and existing materials incurs no cost for our partners, but member states are expected to identify the necessary funds to implement the actions that they wish to undertake. EPAS is also launching a call for voluntary contributions to allow the Council of Europe to financially support some activities (such as the translation of material, the dubbing of the videos or the provision of expertise) when funds are not available at national level. To express your interest in joining Start to Talk, and to have a personalised consultation on the actions, please read the section "Actions proposed" and complete the relevant on-line form. EPAS invites the Council of Europe member states to join this effort and undertake three kinds of actions. The three actions below each contain a set number of "supporting packages" which, when combined, offer states a dynamic set of tools to ensure the action develops. Detailed information about each individual supporting package can also be found below. To express your interest in this particular action please fill in the on-line form. To express your interest in this particular action, please fill in the on-line form. In an individual consultation, depending on your specific needs, the Secretariat can provide advice on process, format, stakeholders and key milestones when organising events on safe sport matters. It can be used for actions A1, A2 and A3. In an individual consultation, depending on your specific needs, the Secretariat can identify gaps, action needed and key campaign messages. The Secretariat has worked together with, and can recommend, highly qualified and experienced trainers and facilitators in the field of safe sport, and can put you in touch with them, depending on your requirements. More information on the pool of experts can be found here. If you are interested, the Secretariat can put you in touch with members of this pool of experts. The full-length video clip and the shorter TV sport are available in the several languages here. How can the clips be used? There are no restrictions on using the video clips. They can be shown at events, on the internet, cinema and on TV. My language version/subtitles are not available: what can be done? The intention is to have the Start to Talk video clips available in as many languages as possible. Interested countries/parties can choose to dub the film into a language other than English, and/or to subtitle the film using an agreed script. The precise text of the translation to be used in voicing and subtitles will require prior approval by the EPAS secretariat. But check first, by contacting the Secretariat to see if the desired language version is already in production. The cost of dubbing the STT video clip into another language is estimated at around 3.000 - 5.000 EUR. The cost of providing embedded subtitles within the STT video clip is estimated at around 300 EUR per language. The Council of Europe’s Human Rights Channel features a Start to Talk action page, which raises awareness and provides information and links to resources aimed at stopping child sexual abuse in sport. The Start to Talk action page can be easily accessed via the Human Rights Channel of the Council of Europe and can be shown at events. It can be used for actions A1 and A3. The Start to Talk action page is not available in my language: what can be done? The intention is to have the Start to Talk action page available in as many language versions as possible. The costs of translating the Start to Talk action page is estimated at around 200 EUR. Otherwise, the Secretariat can provide you with the English language version of the action page, and you can translate it into your language. The Council of Europe would set up the action page in your language, free of charge. In the framework of the Start to Talk initiative, various communication materials such as postcards and brochures were produced to raise awareness on how to prevent child sexual abuse and harassment in sport. The communication materials can be used as a complementary tool to raise awareness on child sexual abuse and harassment in sport. They can be used for actions A1, A2 and A3. The training kit is a set of six factsheets which is currently available in English only. A French version of the training kit will be available soon. The training kit contains important information on facts and figures, legal and regulatory frameworks – amongst other things – and includes a national section which can provide country-specific information. The country-specific information and the translation of the training kit into other languages have to be provided by the interested country/stakeholder. The production of the training kit must follow the graphic charter of the Council of Europe and prior authorisation must be sought from the Secretariat before the interested country/stakeholder initiates any work on translating or producing the kit. The training kit can be used as a tool for the proposed training sessions on safe sport – Action 3. It can be published with the country-specific information and broadly disseminated among stakeholders. It is easily accessible from the Start to Talk homepage. The training kit is not available in my language: what can be done? The intention is to have as many language versions of the training kit as possible. The cost of translating the training kit is estimated at around 2.000 EUR. In the framework of the Pro Safe Sport project, EPAS developed, together with the partner organisations, a self-assessment tool providing stakeholders with the opportunity to assess their own organisational capacity to provide a safe and healthy sport environment for young athletes. The self-assessment tool can be easily accessed on the internet. The tool is only available in English. It can be used for actions A2 and A3. The Start to Talk initiative has its own logo. Stakeholders may use the logo after obtaining approval from the Secretariat. an explanation of how and where the logo will be used. In the framework of the Pro Safe Sport project, a workshop template on safe sport was produced which can help stakeholders to organise their national/regional/local country workshop on safe sport. Stakeholders can use the Pro Safe Sport workshop template as a source of inspiration and adapt it to their own special needs. It can be used for action A3. In the framework of the Pro Safe Sport+ project, a resource centre was set up providing useful information on the prevention of sexual abuse against children in sport, including information on standards and normative frameworks to prevent sexual violence against children in sport. The examples of existing standards, policies, programmes and procedures shall serve as an inspiration for your activities. The resource centre can be easily accessed on the internet. The tool is only available in English. support systems and case management. The good practice examples shall serve as an inspiration for your activities. The resource centre including the examples of good practices can be easily accessed on the internet. The tool is only available in English. These presentations are made available for information purposes. The presentations shall serve as an inspiration for your activities and can be easily accessed on the internet. They can be used for actions A2 and A3. Since 2015, the date of 18 November is commemorated as the European Day on the Protection of Children against Sexual Exploitation and Sexual Abuse. The 2018 edition of this day will focus on the specific theme of "the protection of children against sexual abuse in sport”. All types of activities around this theme are welcome in order to encourage interactions, exchanges, in particular, between children and parents, educators, sports clubs, associations and federations, athletes and coaches, and other professionals. We invite you to join us in the fight against sexual exploitation and abuse in sport and we offer our support if you wish to get involved. If you are interested in organising an event in relation to the Protection of Children against Sexual Exploitation and Sexual Abuse, we can provide you with support as described in the supporting packages. Should you already have activities planned in relation to the topic in 2018, please share them with us. You can get in touch with the Secretariat, if you are looking for more information, assistance and/or are organising relevant events around this date.